The Battle of Heathrow was a decade-long campaign to prevent the massive expansion of Heathrow airport. Initially started by local homeowners worried about local impacts, it eventually grew into a struggle over the future of British climate policy. Near the heart of the struggle was John Stewart, the chair of AirportWatch, who helped hold together a diverse coalition working on the issue. In 2008, the Independent called him Britain’s most effective environmentalist. We got the chance to interview Stewart for several hours at the beginning of our time in London. He was still delighted about the Heathrow victory, and excited to share the story with us, along with a draft of his exciting new history of the campaign. THE SITUATION: Heathrow Airport is the busiest airport in Europe. In 2002, the Labour government expressed interest in further expanding Heathrow by building a third runway and sixth terminal, part of a national airport expansion strategy developed with aviation industry lobbyists. Stewart told us that Department for Transport civil servants were very strongly biased in favor of airline industry lobbyists (and against alternatives like rail, as well as the needs of impacted communities). Former aviation minister Chris Mullin wrote that “the demands of the aviation industry are insatiable” and “the relationship between the airlines and the Department is too cosy.” As the idea continued percolating in government circles, the Department ran a public consultation period from November 2007 to February 2008, with a decision to be made afterwards. STEP 1: FOCUS ON THE LOCAL: The expansion of Heathrow would destroy the village of Sipson, a community of 3,000 people located south of Heathrow. The threat of community destruction and forced relocation galvanized many residents. Residents of Sipson and nearby communities formed the No Third Runway Action Group (NoTRAG) to fight for their homes. Community members had their futures held hostage by the sudden threat of Heathrow expansion. 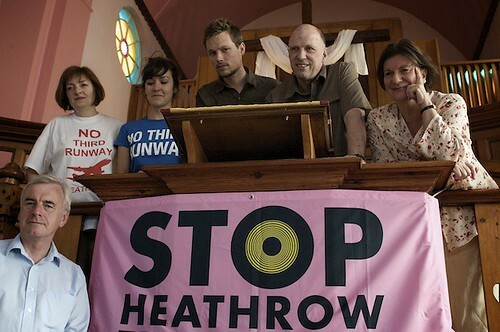 As the most immediate victims of any Heathrow expansion, NoTRAG members were on the frontlines of the campaign, building up organizing capacity with support from coalition partners. Simultaneously, London residents whose homes were exposed to tremendous (and ever-increasing) airplane noise were organized as HACAN ClearSkies. John Stewart came out of that camp; as Heathrow air traffic grew, he had planes flying over his South London home as frequently as every 90 seconds. Member-supported HACAN paid Stewart’s salary, and helped drive the Heathrow coalition. Local activists were tremendously effective in winning the support of local political leaders; NoTRAG was supported directly by the London Borough of Hillingdon, while local authorities provided the use of town halls for meetings. STEP 2: CREATIVE GREEN ACTION: Environmental direct action played an important role in the Heathrow struggle, most prominently via Plane Stupid, a network of media-savvy anti-aviation direct action pranksters. Plane Stupid regularly made headlines, through “serious” actions like occupying runways, as well as media-bait like an activist supergluing himself to the Prime Minister’s jacket at an awards ceremony, telling him “we cannot shake away climate change like you can just shake away my arm.” The anti-expansion direct action movement grew at Climate Camp; Climate Camp 2007 was held right outside Heathrow in threatened Sipson, frightening BAA. Greenpeace was very involved behind the scenes; their high-profile “Airplot” program gave away fractional ownership of land on the runway site to 90,000 people, a media-friendly protest and potential legal maneuver to slow down forcible land acquisition. Work with impacted communities was a hallmark of the direct action movements. Several Plane Stupid members moved to Sipson, while activists from around the country later participated in an “Adopt A Resident” program. Seeds of Change and Plane Stupid later did action trainings with community members, who went on to do several actions of their own, including at a major London aviation conference. 600 people later participated in a safe legal flash mob, wearing red “Stop Airport Expansion” t-shirts inside Heathrow airport. STEP 3: CHALLENGE THE ECONOMICS: It was pretty clear which step John Stewart was most excited about; “for the first time, we challenged their economic arguments.” The case for expanding Heathrow was based on discounting social costs and inflating job creation estimates. HACAN took a risk by commissioning respected Dutch economic consultants CE Delft to write an independent report on “The Economics of Heathrow Expansion.” The gamble paid off: the resulting report was critical of the report that the Department for Transport was using, and concluded that businesses would not leave if a third runway weren’t built. HACAN launched it in London’s financial center, and it was written about positively in leading financial papers. Other reports disproved job creation claims, and used social ROI analysis to show how instead of helping the economy, a third runway would cost Britain a net £5-£7.5 billion. Credibly challenging the economics of expanding Heathrow helped divide business and union support for the project, and drew attention from sectors that wouldn’t normally be swayed by demands from treehuggers or NIMBYs. STEP 4: GET POLITICAL: While the Labour government was pushing the third runway from the top down, local campaigners were doing extensive lobbying to win the support of elected officials, building a cross-party group of MPs and local officials opposed to the expansion of Heathrow. The campaign won the support of numerous local government agencies, several members of the London General Assembly, and in 2008, all four major candidates for London mayor. Labour was divided, while the Greens and Liberal Democrats were both very supportive of the campaign. Several AirportWatch coalition members were active Conservatives, and helped push the campaign within the party, as it worked to develop policy platforms. But it still came as a big surprise when the Conservatives announced if elected, it would end plans to expand Heathrow, while investing in high speed rail instead. Conservative leader David Cameron even sponsored a tree on the Greenpeace Airplot. VICTORY! As 2010 rolled around, campaigners won a major court decision challenging the basis for the Labour government’s Heathrow plans. The elections were coming up in May, and it was clear that opposition to the third runway was stronger than ever; NoTRAG polled local candidates for the House of Commons, and found 82 of 85 responding candidates opposed the Heathrow expansion. Labour lost the election. The day after the new Conservative-Lib Dem government was formed, it formally put an end to the expansion of Heathrow and the other London airports, ending a decade of struggle. Massive high-profile wins are so rare. Sadly, we left London too soon to attend the massive victory party planned for August 28. John Stewart invited us to an AirportWatch meeting, where we saw how much work is still left — ending national airport growth, curbing noise issues, building better alternatives. Campaigners are still dreaming big. But this victory is still sweet, and we know organizers are savoring the moment.